This Standard Operating Procedure (SOP) is applicable to the chemicals, reagents and solutions used in analytical testing designed to define and standardise labelling and handling procedures in laboratories. 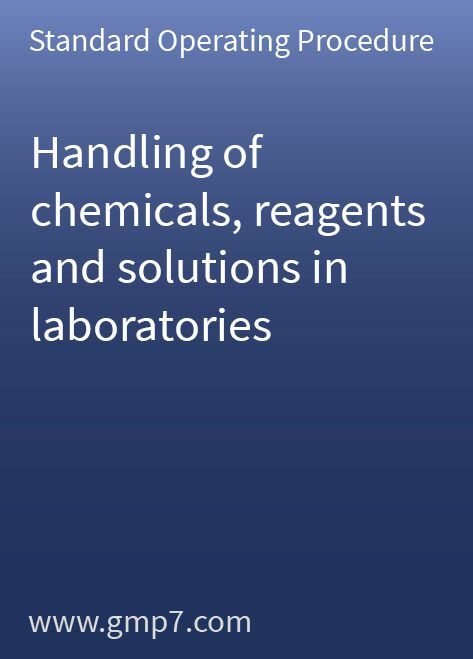 The appropriate handling of chemicals, reagents and solutions and the process of assigning them a reasonable shelf life are key procedures in the quality laboratory that ensure the validity of all analytical results. During inspections, inspectors expect quality laboratories to have sound procedures and controls in place. This Standard Operating Procedure (SOP) only needs a small amount of site-specific modification before it can be adopted for your operations. You will be able to enter your data into the Word document. Please note: We do not deliver hard copies. Here's how it works: Download your copy of this document and if for any reason your aren't completely satisfied after SEVEN ENTIRE DAYS just give us a call, and we'll personally guarantee you get a complete refund. Email Adress * Will be not be public. Very inexpensive and great for GMP!